When developing my Growing and Learning Green workshop, one of my goals was to include some eco friendly crafts that make good use recycled materials. While waiting for inspiration to strike, I came across and purchased Craft Star: Green Crafts: Become an earth-friendly craft star, step by easy step! written by Megan Friday. Bright and cheery, the book is generously illustrated with photographs and drawings. It includes introductory remarks, information about tools and materials, project templates and sixteen eco friendly crafts ranging from decorating a canvas tote bag (with paint or fabric) to working with reusable water bottles, gift bags and picture frames. As well, there are ideas for designing and decorating t-shirts, working with used blue jeans fabric, making a special gift for Earth Day, creating lightswitch plates with eco-friendly messages and using a decoupage technique to decorate a glass bowl. The eco friendly crafts will be enjoyed by children aged eight and up. 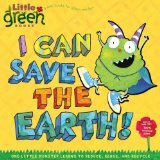 Be sure to visit our page highlighting picture books about caring for our environment, ecosystems, recycling, reducing our environmental footprint and more. 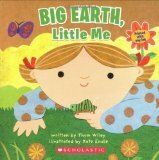 Terrific resources for Earth Day and Arbor Day.